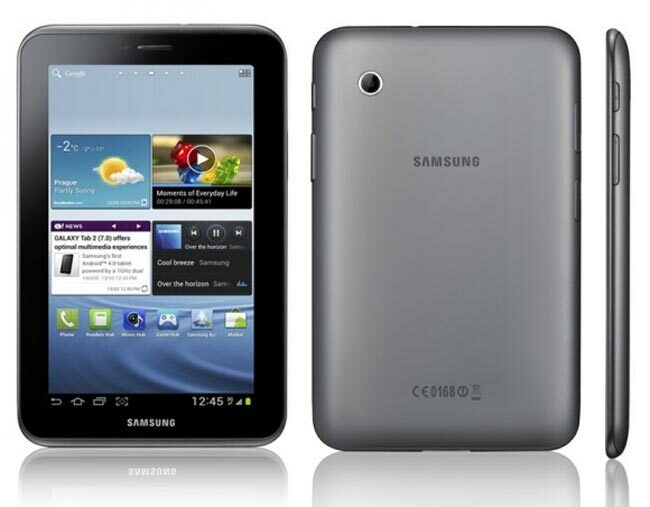 Samsung has announced their first Android 4.0 Ice Cream Sandwich tablet, the Samsung Galaxy Tab 2, which is the successor to the original Galaxy Tab, and is expected to be cheaper than the Galaxy Tab 7.0 Plus. The Samsung Galaxy Tab 2 comes with a 7 inch multi-touch touchscreen display with a resolution of 1024 x 600 pixels, there is also a dual core 1GHz processor and 1GB of RAM. Other specifications on the Samsung Galaxy Tab 2 include a 3 megapixel rear facing camera, although it doesn’t feature a flash, and a front facing 1.3 megapixel camera for video chat. The device also comes with WiFi, Bluetooth 3.-, A-GPS and a choice of either 16GB or 32GB of built in storage plus a microSD card slot, and it will feature Android 4.0 ICS plus Samsung’s TouchWiz UI.